Herping for reptiles and amphibians including lizards, snakes, frogs, toads, turtles, newts, salamanders and other interesting creatures in their natural habitat in France, with map locations, sharp pictures and poignant commentary. French herping at its best. Herping in France ended up being more fruitful than I had imagined. After my two-month stint in Ireland for the company I work for, I was looking forward to taking some time off to travel to France. 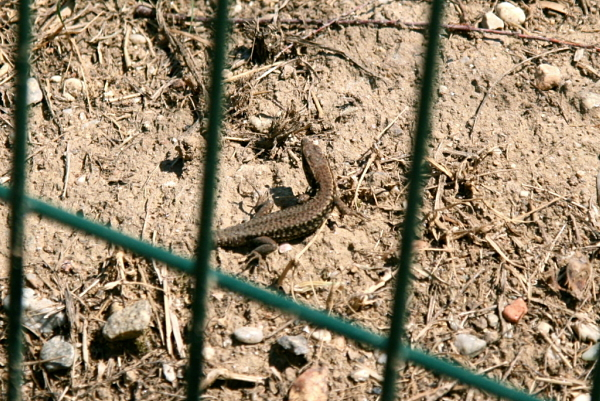 French herping couldn't possibly be more difficult than what I had experienced in Ireland, so I was really optimistic. 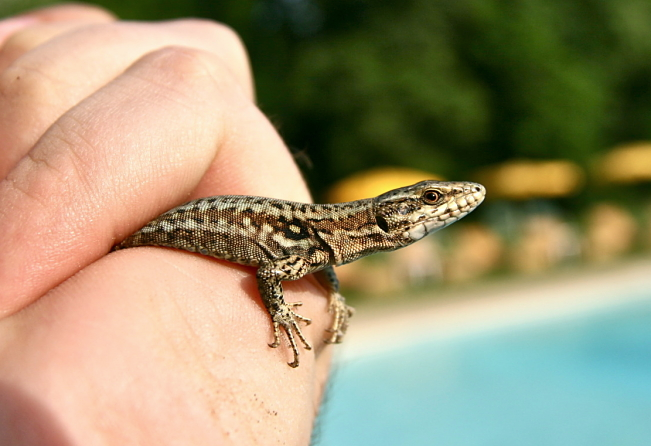 France has many reptiles and amphibians—too many to list in a quick herping summary. During the Summer months, France gets just plain hot, especially the southern coast bordering the Mediterranean Sea. Below I'll detail my experiences herping in France, spanning from Sabran to St. Tropez, and a few spots in between. All pictures are in situ, with the exception of a couple Common toad handling photographs. 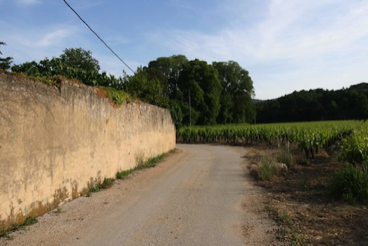 I spent one day herping in Sabran, about 40 km outside Avignon (pronounced "ah-vin-yo"), in a tranquil, vineyard-laden area with a real French countryside feel. Fortunately, there were a couple ponds, and plenty of forest, right where I was staying. I could hear the frogs calling. 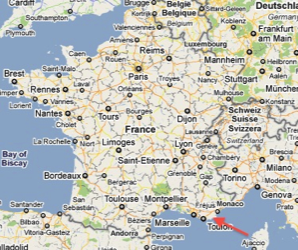 The red arrow on the map above points to the area where I began herping in France. It was a warm day with clear skies and very little breeze. It didn't take long to spot my first reptile. 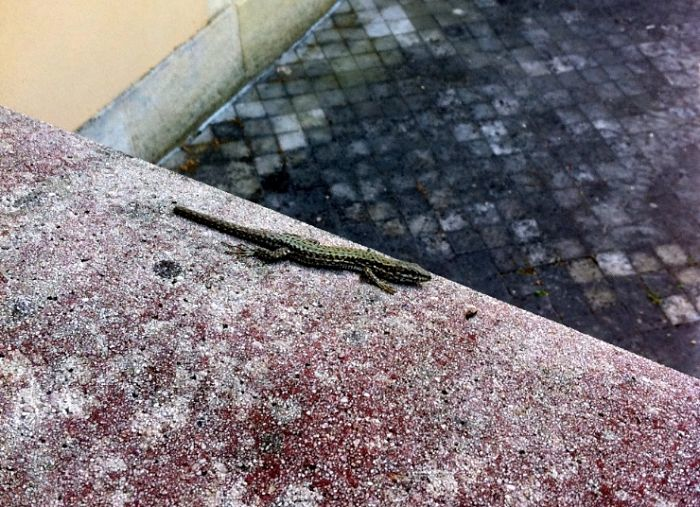 While bringing my luggage into the cottage-style hotel, I looked to my right as I entered the doorway and saw a Common Wall lizard (Podarcis murals) with a stump-tail staring at me from the nearby ledge (picture below). My first lizard sighting of the trip, and a herping lifer at that, in a matter of minutes following arrival. Not bad. A harbinger of things to come? Perhaps. Common Wall Lizard (Podarcis murals) in Avignon, France (in situ). Soonafter, I flipped a few medium-sized rocks and found this beautiful Common Wall lizard (Podarcis murals) hiding underneath. 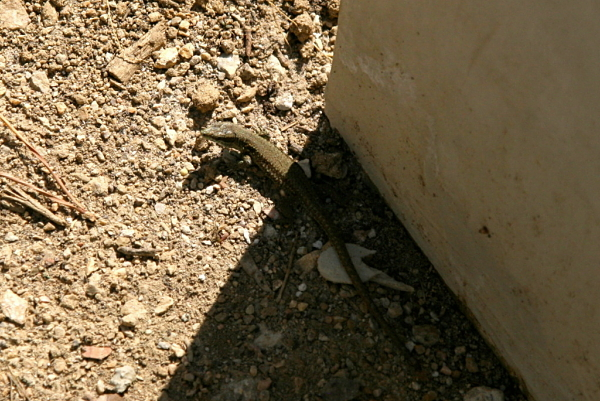 Another Common Wall Lizard (Podarcis murals) in Avignon, France. I caught this one under a rock. Two of the several areas I herped in Avignon--lizards frequented the stucco walls. 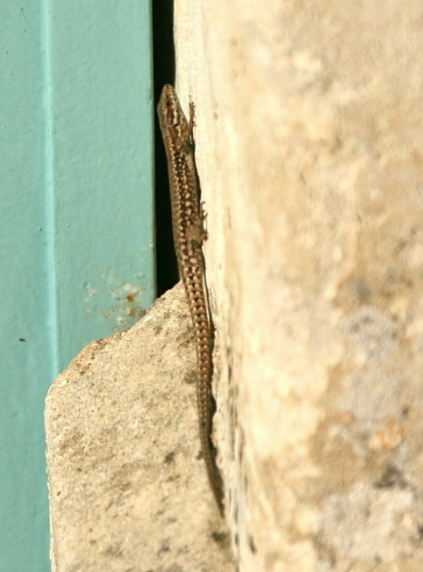 Here's another Common Wall lizard on a stucco wall in Avignon, France (in situ). It didn't take long to find some amphibians herping in France, specifically, frogs. They were calling loudly during the day and night alike. Some of the strangest frog calls I've ever heard, actually. Really interesting. Here are some tadpoles I found in a small pool next to a large ornamental pond. 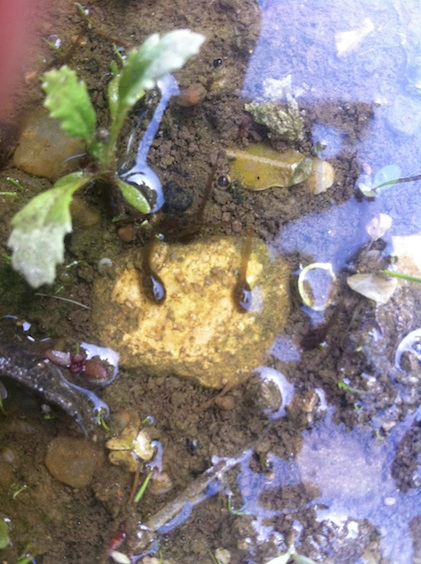 Here are some small tadpoles I found in nothing more than a puddle in Avignon, France. 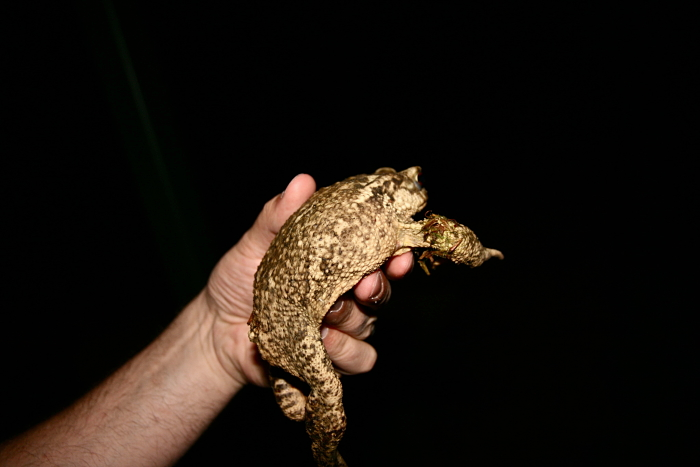 That evening, at about 11pm, I decided to do some night herping. It didn't take more than about two minutes to find something. As I was walking down a path, I heard something—something big—moving behind me. I spun around and saw the biggest toad I've ever seen. After looking it up, I found out it's the Common Toad (Bufo bufo). A large Common Toad (Bufo bufo) I found in Avignon, France. It was a calm, beast of a toad. Another shot of the Common toad I found herping in Avignon, France. It was a gentle giant. One last picture of the largest toad I've ever seen while herping. 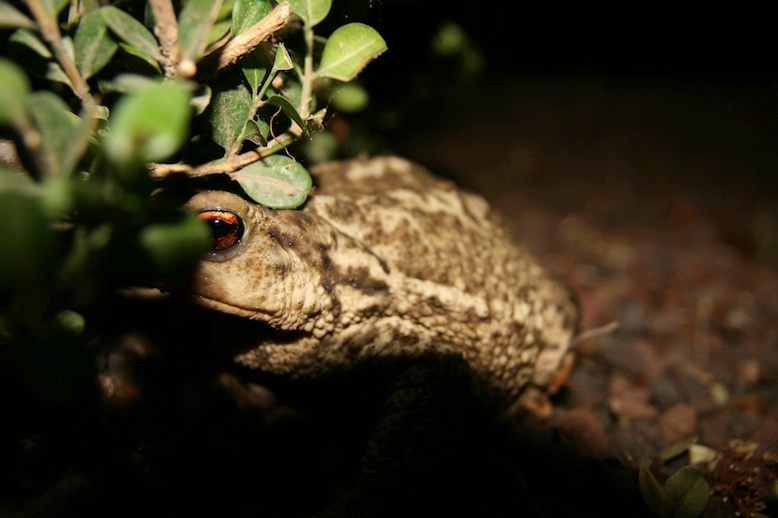 Here is a short video of the Common toad (Bufo bufo) sitting near the bush where I found it. I happened to be walking along the ornamental pond (it was producing an absolute cacophony of amphibian calls), and saw a very large frog perched on the wall, so I approached it slowly. As I got closer, it looked like the frog was joined with another frog in some way. When I was within about 15 feet, it jumped down onto the ground. What I discovered as I got within a few feet was that there were two extra frog legs protruding from the large frog's mouth. 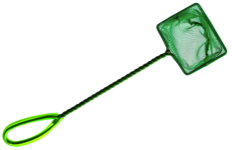 It was, in other words, in the process of swallowing a smaller frog. The large frog proceeded to spit out the smaller frog (white belly up in the below video) and jumped into the water to avoid me. Two days in the well-known coastal town of St. Tropez (pronounced "san-troh-pay") meant plenty of Sun and the turquoise beaches of the Mediterranean Sea. 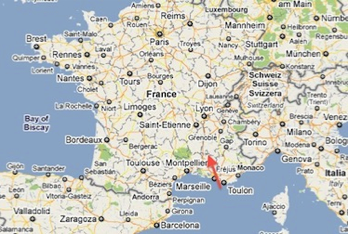 The red arrow on the map to the left points to the area where I was herping in St. Tropez. 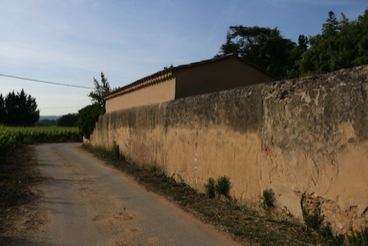 It's about two hours south of Avignon, on the southern coast of France, and a bit warmer and more tropical. Despite my expectations, which were that I would see lizards on just about every wall during daylight hours, I only saw the two pictured below. I saw countless tadpoles in a nearby ditch, but things got a bit more interesting once dusk arrived. 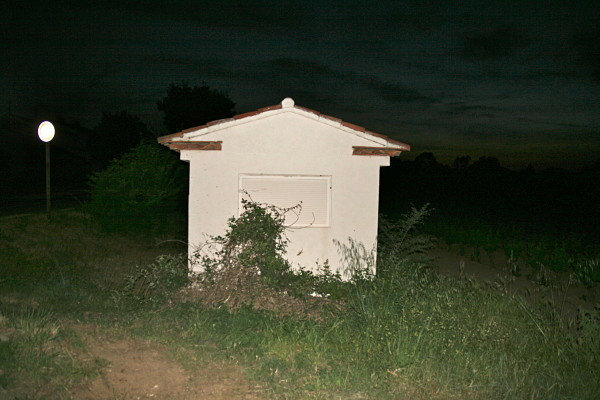 Driving back from dinner, I saw what looked like a decent-sized lizard on a roadside pillar. I turned the car around, and it was indeed a lizard. A gecko to be exact—a Moorish gecko (Tarentola mauritanica). The gecko let me get fairly close for a few pictures, which you can see below. 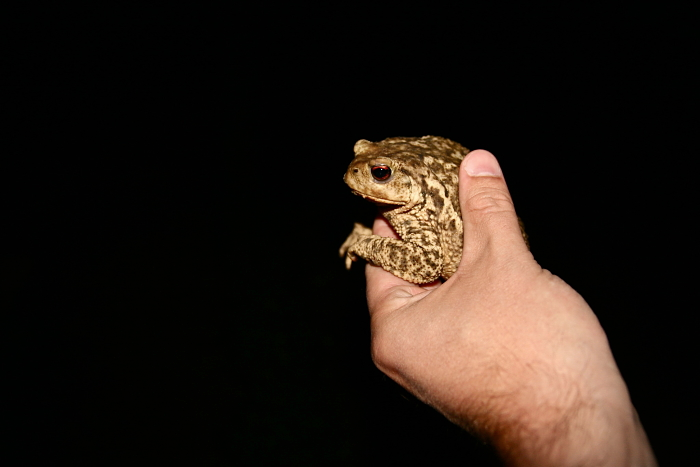 It was pretty exciting, and led to more night herping that evening. 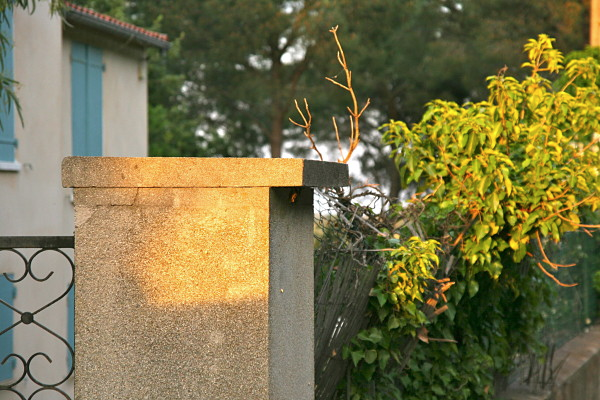 Here's a view of what I noticed while driving down the street in St. Tropez. Notice the lizard underneath the pillar eave. Upon closer inspection, it turned out to be a Moorish gecko (in situ). That evening I drove along a few quiet roads specifically looking for more Moorish geckos hunting near insect-laden street lamps. 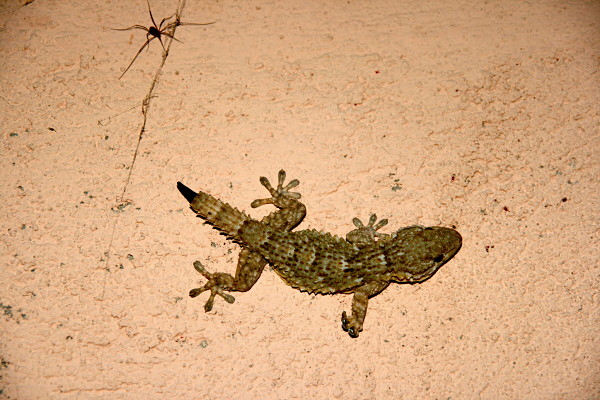 About one minute into my herping drive, I spotted a medium-sized, gecko on a wall. After pulling over for closer inspection, I saw that it was another Moorish gecko, this one with a stump-tail that was regenerating. 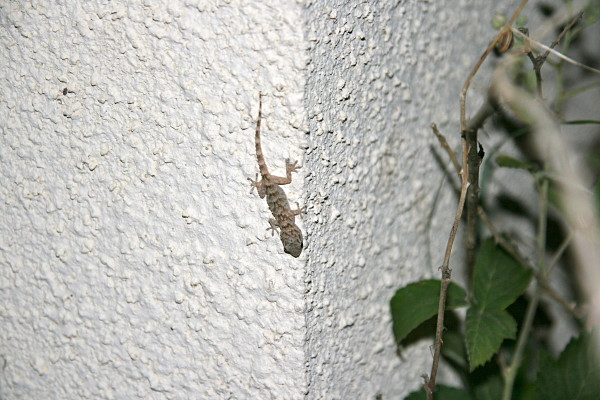 The small stucco building in the above picture had three Moorish geckos on it, one of which was a hatchling gecko pictured below. Generally speaking, the geckos were either very skittish, or very tolerant, when it came to approaching them for pictures. 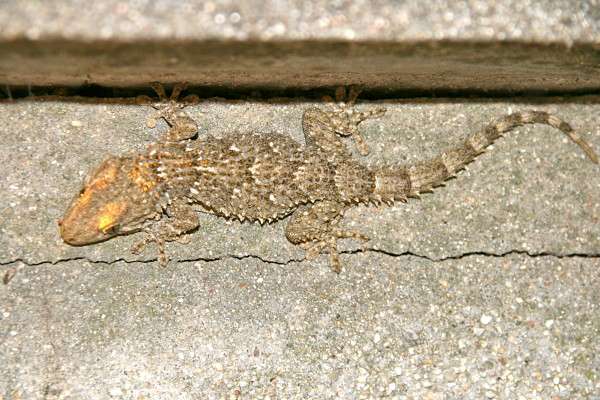 Here's a hatchling Moorish gecko I saw while herping in France at night. The limited amount of time I had to do some herping in France did pay off, and was really enjoyable. Both areas yielded reptiles and amphibians including lizards, frogs, toads, and tadpoles. France has a variety of herps, and I look forward to returning one day to find some more. 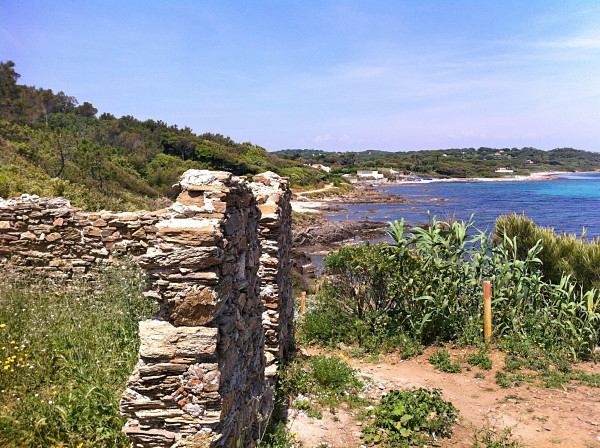 This is where I was doing some coastal herping in St. Tropez, France. The Mediterranean Sea can be seen on the right.